Polyester – to recycle or not to recycle? I know it’s hard to imagine that the lovely fabric you’re eyeing for that chair – so soft and supple and luxurious – is just another plastic. But because 60% of all polyethylene terephalate (PET – commonly called polyester) manufactured globally is destined to be made into fibers to be woven into cloth, and because polyester absolutely dominates the market, and because the textile industry has adopted using recycled polyester as their contribution to help us fight climate change, I think it’s important that we keep up with topics in recycling plastic. If using recycled polyester is good, then using “post consumer” PET bottles is deemed the highest good. 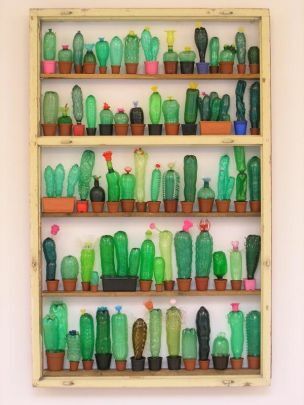 But an interesting thing is happening with PET bottles and recycling, according to a study published in August, 2010, by SRI Consulting, which is, according to their web site, the world’s leading business research service for the global chemical industry (www.sriconsulting.com). The study, PET’s Carbon Footprint: To Recycle or Not to Recycle, caused more than a few ripples because it concluded that in many cases recycling bottles is no better — and could be worse — than landfilling. The study’s key finding — widely reported — is that a recycling facility needs to recover at least 50 percent of the material it takes in if it is to achieve a more environmentally favorable carbon footprint than simply disposing directly to landfill. The key is to improve yields , especially in sorting and to a lesser extent, in reprocessing. In order to calculate the carbon footprint of various PET products, the study calculated the carbon footprint for PET bottles used to package drinks from “cradle to grave,” i.e., extending from production of raw materials (primarily oil and gas) through to disposal of all wastes. The study considers a base case—bottles are used by consumers in northwest Europe, collected in a curbside system and sent on for sorting and recycling—and variations on that theme, including PET-only take-back (as currently practiced in Switzerland) as well as no recycling (with scenarios of “all landfill” and “all incineration”). Sensitivities of all major variables were assessed. The study concludes that the curbside take-back systems are no better than landfill, in terms of carbon footprint. From a carbon-emissions standpoint, it would be just as well to bury used bottles as to recycle them, and either would be a better option than burning them. The study found that landfilling PET bottles from certain systems rather than incinerating them could reduce carbon footprint by 30%. Call it “carbon capture and storage” on an economy budget. The key is to have the room – and if you read Thomas Friedman’s Hot, Flat and Crowded you may be hard pressed to agree that there could ever be anyplace on the planet with room! As you might expect, there was a bit of an uproar over the study. And how does all that trash get into the oceans? How does that figure into this equation? Hey, I never promised answers. The Biodegradable Products Institute (BPI) cites a 2006 American Chemistry Council study showing that most consumers believe a product labeled “biodegradable” will go away completely and on its own in a year or less. The BPI says many consumers also believe that these products will “biodegrade” in landfills. Because it seems a desirable product attribute, the term “biodegradable” has been applied to a wide range of products—even those that might take centuries to decompose, or those that break down into harmful environmental toxins. Biodegradability is definitely perceived as a positive trait, yet it could be applied to virtually anything because anything is biodegradable, given enough time. The Federal Trade Commission (FTC) in the U.S., however, has issued some general guidelines on what types of products qualify as legitimately biodegradable, and has even sued companies for unsubstantiated, misleading and/or deceptive use of the term on product labels. But the FTC acknowledges that even products appropriately labeled as biodegradable may not break down easily if they are buried under a landfill or are otherwise not exposed to sunlight, air and moisture, the key agents of biodegradation. In fact, in landfills materials degrade very, very slowly – if at all! This is because modern landfills are designed, according to law, to keep out sunlight, air and moisture – the very ingredients needed for materials to biodegrade. This helps prevent pollutants from the garbage from getting into the air and drinking water, and slows the decomposition of the trash. In Dr. William Rathje’s book entitled “Rubbish,” he sites that “The truth is, however, that the dynamics of a modern landfill are very nearly the opposite of what most people think…Well designed and managed landfills seem to be far more apt to preserve their contents for posterity than transform them into humus or mulch. They are not vast composters: rather they are vast mummifiers.” In his book, Dr. Rathje talks about doing excavations on 15 landfills throughout North America. From those digs, they found 40 year old newspapers that were still legible, 5 year old lettuce and a 15 year old hot dog. From these studies it seems fairly clear that even organic materials take a very long time to break down in landfills let alone plastic or other items. The reality is if any product ends up in a landfill, it will not degrade. But the fact that a product breaks down – if it does indeed break down – may not be as important as what the product breaks down into. In a perfect would all products would break down to CO2 and H2O. But it gets more complicated as we increase the number and kinds of chemicals. The banned pesticide DDT is hazardous and toxic in its own right. And it does biodegrade, though rather slowly. The problem is that its breakdown products of DDD and DDE are even more toxic and dangerous than the original DDT. So just because a product or ingredient is biodegradable does not mean it is healthy or safe for people or the environment – especially if it leaches harmful chemicals into the ecosystem. Under this definition, even regular oil based plastic can be advertised as “biodegradable” because at some point, sooner or later, it is going to break down into small pieces. 1. Biodegradable – i.e., 60 – 90% of the product will break down into CO2 within 180 days in a commercial composting facility. 3. Eco-toxicity – the product will not deposit heavy metals that are toxic to the soil beyond that found in typical compost. 4. Compostable products have the added implication that when they break down they turn into humus, which provides valuable nutrients to the soil. So, while some products are considered biodegradable, they may not be considered compostable because they either don’t meet the heavy metal requirements, don’t break down in a timely fashion or don’t contribute valuable nutrients which improves the soil. 4. it uses scarce land and water resources to produce the raw material, and substantial amounts of non-renewable hydro-carbons are burned and CO2 emitted, by the tractors and other machines employed. 5. If buried in landfill, compostable plastic can emit methane (a greenhouse gas 23 times more powerful than CO2) in anaerobic conditions. Many industrial composters of organic waste around the world do not want plastic of any kind in their feedstock, because it is difficult to separate biodegradable plastic from ordinary plastic. Home composting of plastic is not encouraged, as it will often be contaminated with food residues, and temperatures may not rise high enough to kill the pathogens. Compostable plastic is useless in compost because 90% of it has to convert to CO2 gas in order to comply with ASTM D6400 and the other composting Standards. It therefore contributes to greenhouse gases but not to the improvement of the soil. 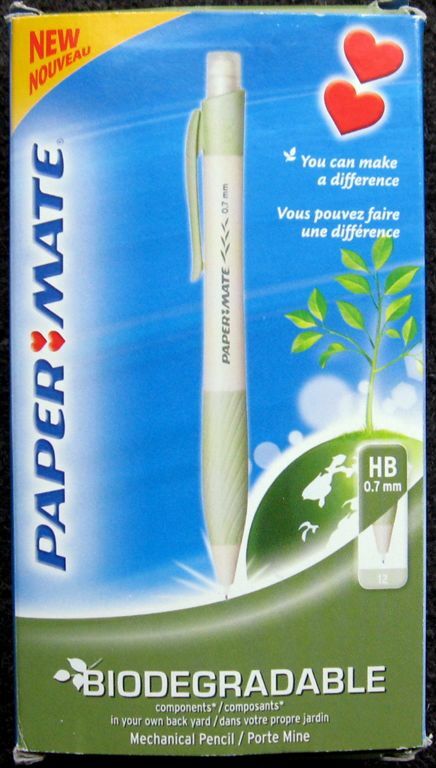 Meanwhile, you can follow Dave, who buried an advertised Paper Mate biodegradable pencil in his backyard last summer and says he will report on it’s degradation over time. Click here to read more and follow the story! So how does this apply to fabrics? Well, for starters the companies that make PLA (polylactic acid) based polymers – those corn based bio plastics – advertise that their products are biodegradable. PLA is said by the manufacturer to decompose into carbon dioxide and water in a “controlled composting environment” in fewer than 90 days. What’s a controlled composting environment? It’s not exactly your average backyard bin, pit or tumbling barrel. It’s a large facility where compost—essentially, plant scraps being digested by microbes into fertilizer—reaches 140 degrees for ten consecutive days. So, yes, as PLA advocates say, corn plastic is “biodegradable.” But in reality very few consumers have access to the sort of composting facilities that can make that happen. NatureWorks (the largest manufacturer of PLA, owned by Cargill Dow) has identified only 113 such facilities nationwide. And unless the chemicals used during processing of your fabric are such that there are no chemicals which would combine with other chemicals to form molecules of anything other than water, carbon dioxide and safe organic material – then it cannot be called compostable. If the chemicals used during processing contain, for example, heavy metals in the dyestuffs – then those metals become available to your plants in the garden – and that again knocks it out of the “compostable” set of products. That might be o.k. if you’re growing roses rather than radishes, but if you plan to eat those plants I’d look elsewhere as a way to dispose of your fabric. Certified fabrics made of natural fibers which look at the chemical inputs of processing (such as GOTS and Oeko Tex) would be o.k. for use in a vegetable garden – because they have been tested to be free of toxic inputs – and they could be called “compostable”.